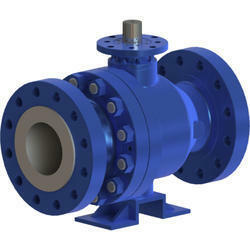 Our product range includes a wide range of two piece ball valves. The Sankey Trunnion series ball valve can handle a vast variety of fluids, semisolid and almost any corrosive service on chemical, oil, petrochemical, gas, pulp, paper processing and other industries. Our standard valves with CFT seats are suitable for steam up to 18 bars. Stems and trunnions are manufactured separately from the ball and supported by a bearing and thrust washer to ensure low consistent torques. Triple independent low emission stem seals ensure stem seal integrity. All valves include emergency secondary stem sealant injection system. Special wide seat insert design provides an increased life in difficult service conditions. Seat ring sealing includes separate graphite seals for fire safe design and O-rings for tight sealing. DBB – Double block and bleed design with self-relieving body cavity per API 6D.